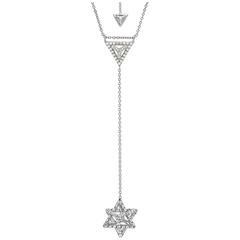 Merkaba 18k yellow gold necklace featuring a total of approximately 1.12 carats of round brilliant diamonds, F-G color and VVS2-VS1 clarity. 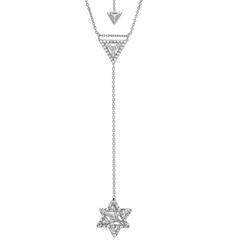 This heirloom-quality, sacred geometric jewelry piece, suspends elegantly at the chest, measuring 0.68 inches, a three-dimensional symbol of universal light. The chain features a unique, triangle-stop closure for a choice of two lengths, 16-18 inches. *Each piece comes with a certificate of authenticity and unique serial number. *Made by extremely skilled hands in the USA, Merkaba is a shining chariot for global unity. *You are welcome to log on to our website - TheMerkaba - to learn more about us. WHAT IS MERKABA? 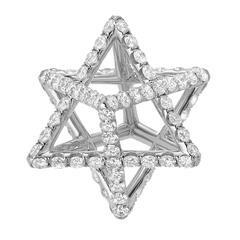 Merkaba is the world's most precise and precious geometric jewelry, made with love and the purest of intentions. It is our honor and privilege to bring to the world this most sacred geometric form. 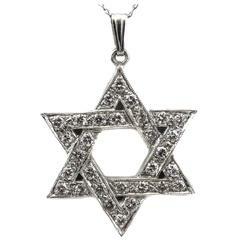 The upward and downward interlocked tetrahedrons create a three-dimensional Star Of David. The Merkaba Star Of David represents the duality of existence—body and spirit—united in the harmony of a singular form. The top is male, the bottom female. Together, they are one light. Since each of its corner points are equally distant from each of its others, in a sacred geometrical pattern, there is no strain or tension in the Merkaba. Only rest in equilibrium. It expresses the potential of a world of community and peace where no one is separate. All are one and one is all. The Merkaba has been shared, taught and utilized for thousands of years and through many ages of life. All major spiritual systems place ultimate power in it. In the Bible, the Angel Ezekiel accessed the Merkaba to ascend to heaven. In the Torah, it is the chariot, the throne of God. The Zohar, the foundation of the Kabbalah, realizes that in awareness and selfless action you bring yourself closer to the very heart of the Merkaba. The purpose of Yoga is to save individual souls from the calamity of separate existence, the same ideal of unity symbolized by the Merkaba. Zen Buddhism is a path to enlightenment focused on meditation, to the same higher consciousness the Merkaba so beautifully represents. The Merkaba is the most powerful symbol of spiritual evolution. It is not something you can read or learn about. It is something you must experience. Discover the light. You Are The Merkaba. 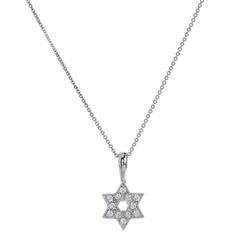 0.18 carat of pave set diamond (G/SI1) adorn a beautifully handmade 18 karat white gold Star of David in this H and H pendant necklace. 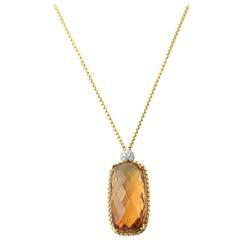 David Yurman 18k yellow gold necklace featuring a cable accented rectangular faceted citrine hanging from a pave diamond ball. This piece has a lobster closure.